The yellow bag on the door. It hung there for months. One day, curiosity drew me to the front porch of the vacant home across the street. “WAYNE COUNTY TREASURER. 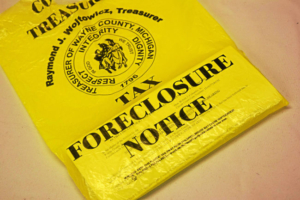 TAX FORECLOSURE NOTICE,” the bag read. Inside were papers with figures showing delinquent property taxes and words… lots of words. Two years later, I bought a house on the west side. A two-family flat. I had a plan. I was going to fix it up and rent it out. First, I needed to meet the mother and daughter who already lived in the lower unit. They told me their story, rather anxiously, uncertain of my intentions. I discovered Lynett was the previous owner, now a tenant in her own home. Lynett, a young widow, had worked the same job for over 15 years. When her husband got sick and eventually passed, everything fell apart. When she couldn’t afford the tax bills, the county foreclosed on her home and sold it on the internet in public auction. It went through a few investors hands until it sold to me. There I stood in my new house. Her home. I learned rather quickly that Lynett’s story was not an anomaly. Since 2002, 1 in 3 homes in the city of Detroit have gone up for public auction. 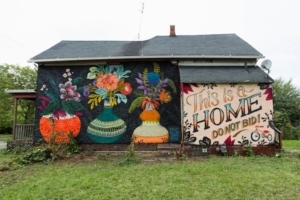 While some, like the house on my block, are vacant… many, like Lynett’s, are occupied. And the end is not in sight. It is estimated that 36,000 yellow bags were posted to homes that are subject to foreclosure in 2019. My “awakening” to this epidemic in our city thrust me into the work of tax foreclosure prevention. After several years of volunteering in this way, I actually found someone who would pay me to do this work. I am honored to work for my host company is the United Community Housing Coalition, an organization that has been at the forefront of this work for decades.